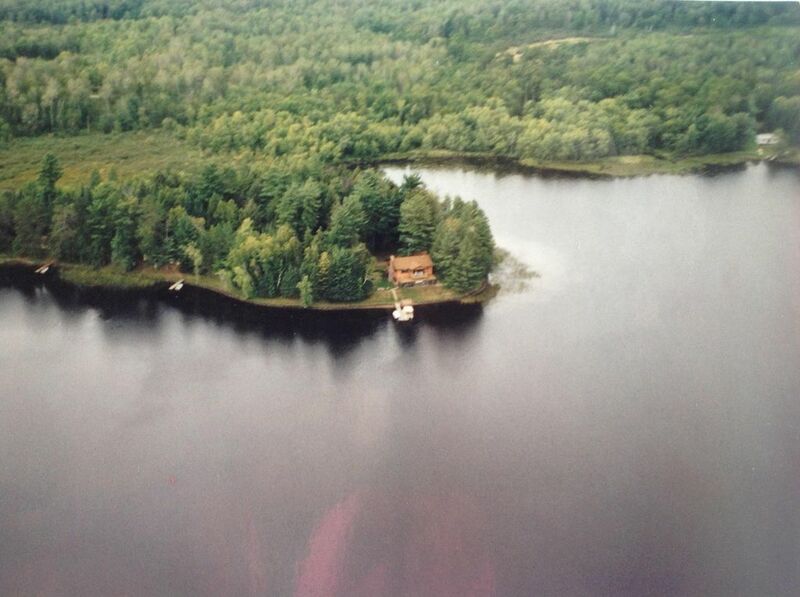 This four bedroom cabin is located just 30' from the water's edge on this quiet sportsmen's lake. The call of the loon can be heard echoing across the morning mist. The lake is a class A musky lake which anglers will appreciate. Items included with the cabin are: four double beds, stove, refrigerator, microwave and kitchen utensils, 3/4 bath, deck, pier, picnic table, fire ring, and swimming area. A 14' aluminum rowboat comes with the cabin. Kayaks and a paddleboat are available for your use. The cabin is located in a resort setting with two other cabins on a peninsula. WiFi is available at the main house. There is a playground for small children. The east fork of the Chippewa River runs through the lake and keeps the water cold enough for small mouth bass to bite all summer. If you bring your own boat we are also only 10 minutes to a boat launch on the Chippewa Flowage. We have been cabin owners for almost 20 years. We love the area and live here year round. We know where the best fish fries are and many secret spots. We are on the location to help you with any of your needs. We chose this property on a cold January day and had to wade through knee high snow in order to get back to the cabins. We went out on the frozen lake and looked at the property from the lake and fell in love with it. We always wanted to live down a sunny dirt road deep in bear country. The view from the windows of the cabin is trees and water. Around the bay, perched high in the tree is an eagle's nest that produces young every other year. A class three rapids exits the lake and heads onto the Chippewa Flowage. Very clean and spacious cabin! Roomy and clean cabin on a beautiful quiet lake. We had 6 adults and a child, we all had our own bedrooms which was nice. Big lake! Owners are very nice too! Would reccomend this stay! We found the cottage to be as advertised. The owners were extremely helpful and friendly and we had an excellent family retreat. We would surely consider a return visit. Relatively last second booking for us for a busy labor day weekend but this ended up being exactly what we needed. Cabin is small but surprisingly fits 4 bedrooms without feeling too cramped. Have to share 1 bathroom which is a downside but workable and the kitchen could be updated but like I said, served our purposes splendidly. Wifi only works up near the main house but it was a nice excuse to disconnect for a bit. Lake is gorgeous and very peaceful, was not crowded at all which was surprising on a holiday weekend. We hit up the nearby golf course which was nice and well kept and we very much recommend taking a boat or kayaks out to the middle of the lake for sunrise (bring some coffee!). Mike and Karen were very welcoming and accommodating, thanks guys! There were so many things for the family to do. The lake was very serene. The cabin was just as described and exactly what we needed. Thank you for a relaxing weekend. Located just 25 miles southeast of Hayward, Wi, this property is in the Chequamegon National Forest on the shore of 240 acre Barker Lake. We are 1/2 mile from Barker Lake Golf Course built by the gangsters in the 1930's. There are many activities in the Hayward area including the Lumberjack World Championship, Musky Fest, and Honor the Earth Powwow.